Happy Pi Day! We couldn’t let the day go by without sharing a new favorite pie recipe. 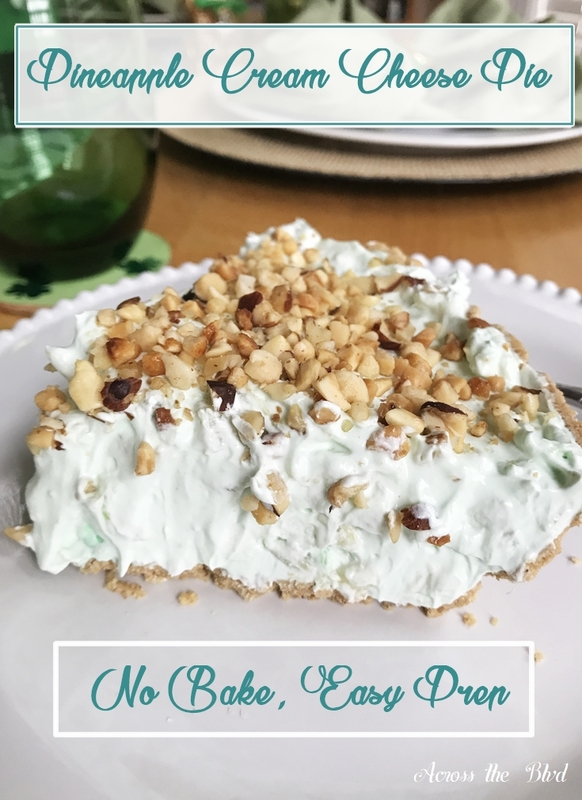 This Pineapple Cream Cheese Pie With Nut Topping is quick to make, requires no baking, and best of all it’s a no fail recipe. 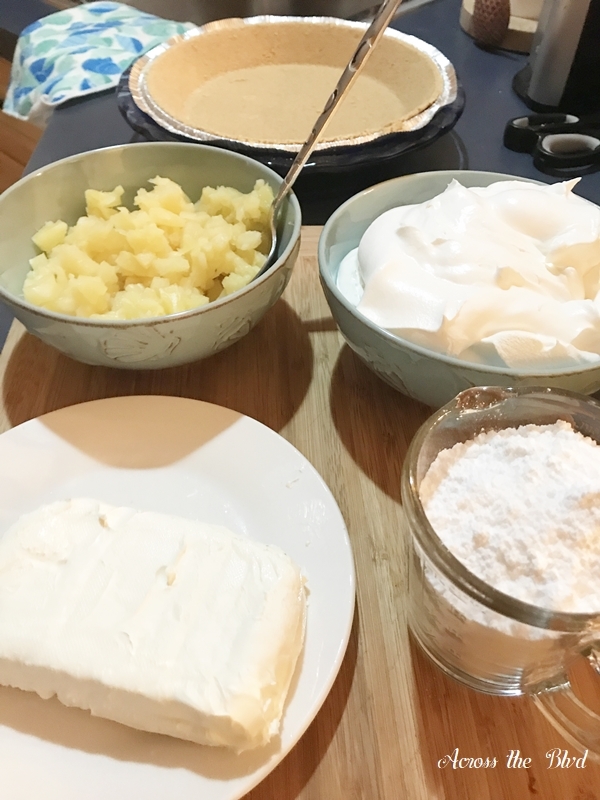 I love using cream cheese and whipped cream topping in pie recipes and I wanted to make something that I hadn’t tried before. I wanted it to be something other than chocolate. I love chocolate pie in all of its varieties, but now and then I want something fruity instead of chocolate. 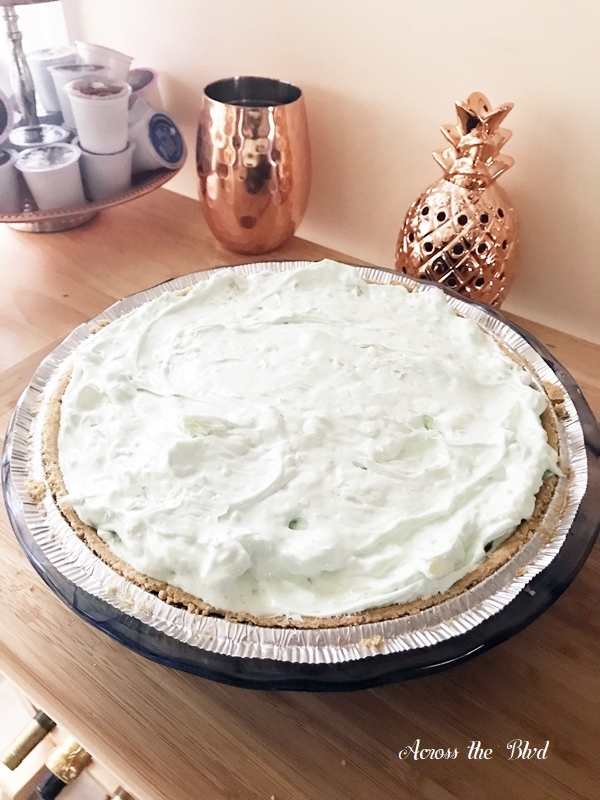 I searched for pineapple pie and found more recipes than I ever thought I would! Lots of them had coconut in them. While I think this would be great with coconut added, coconut is not a favorite among most of my family. For me, pie making also needs to be easy. I don’t make any claims to being a made from scratch pie maker. I decided to use items I had in the pantry and the fridge and create a fruity, tasty pineapple pie. Using canned pineapple, whipped topping, and a ready made crust means this is easy to put together. 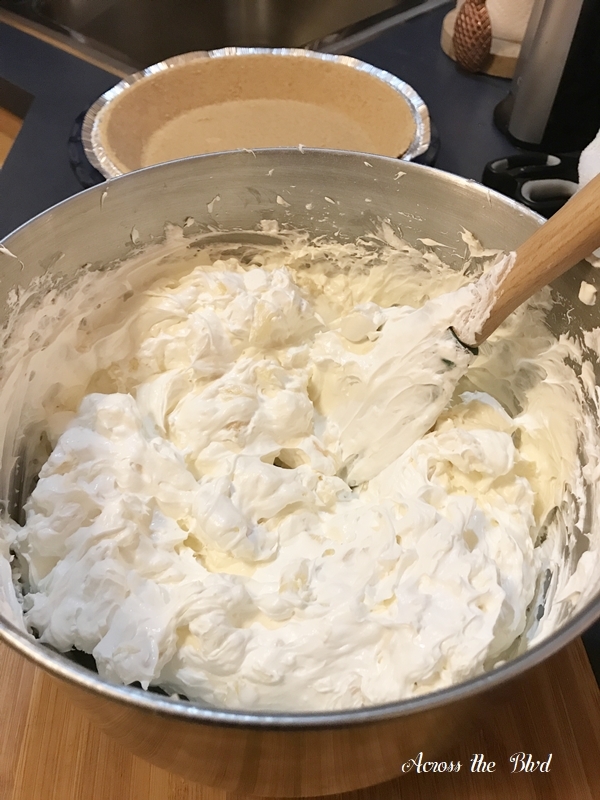 Once the cream cheese and powdered sugar are mixed together, the whipped topping is added and mixed in until it’s well blended. Crushed pineapples and mini marshmallows are folded in. 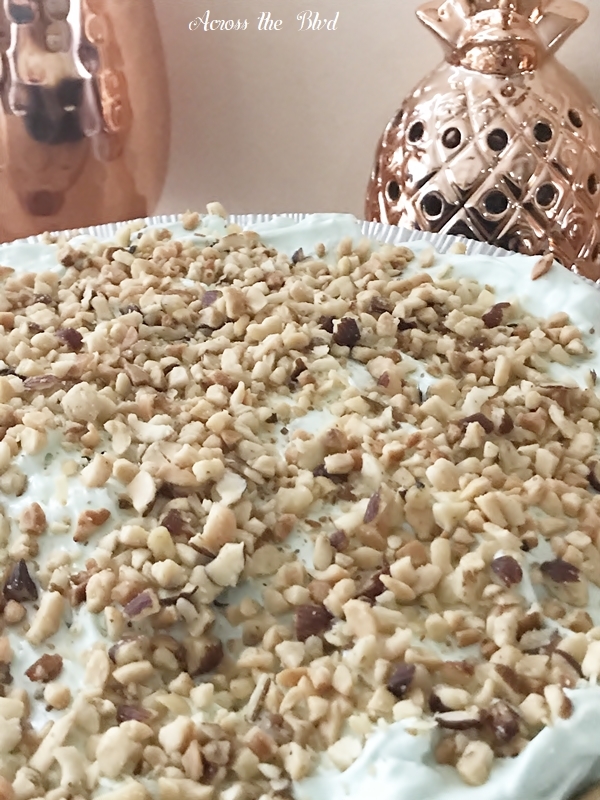 Since it’s spring time, I added a couple of drops of green food coloring to give the pie a spring time look. The mixture is spooned into a graham cracker pie crust and refrigerated for at least two hours before serving. After the pie is set, remove from the refrigerator and sprinkle on a nut topping. Slice and serve. It’s a delicious, creamy mixture of pineapple, cream cheese, marshmallows, and whipped topping. 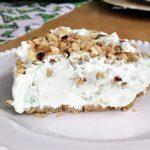 The nut topping adds to the flavor and the texture. Cream powdered sugar and cream cheese together in electric mixer. Add whipped cream to mixing bowl and continue to mix until well combined. Drain crushed pineapple. Fold in pineapples and mini marshmallows. Stir until combined with mixture. 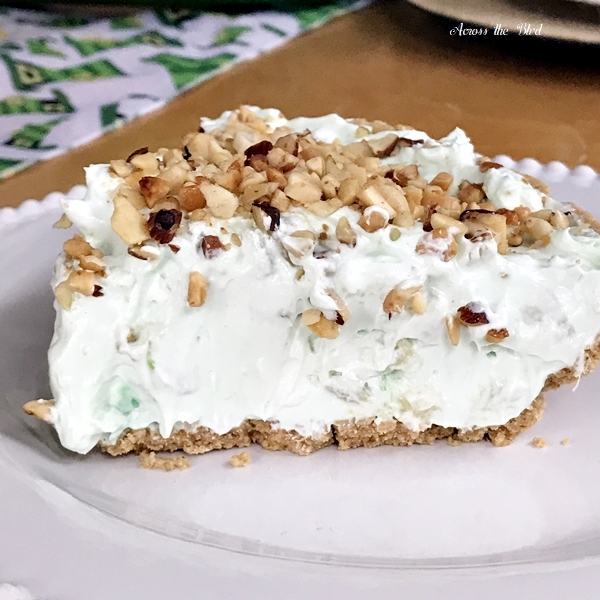 Remove from refrigerator and sprinkle nut topping on top of pie. Slice and serve immediately. 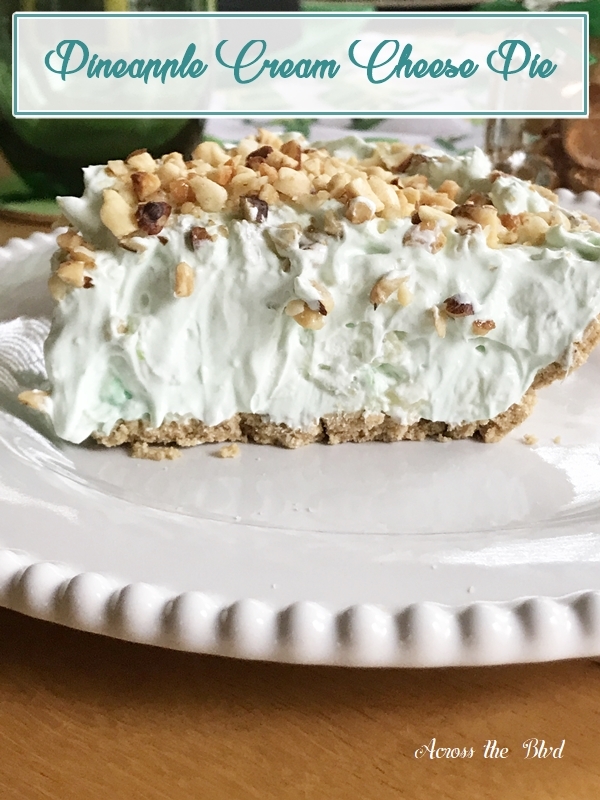 If you enjoy quick and easy desserts, I hope you’ll give this one a try! For another quick and easy pie recipe, have a look at my recipe for Strawberry Lemonade Pie. 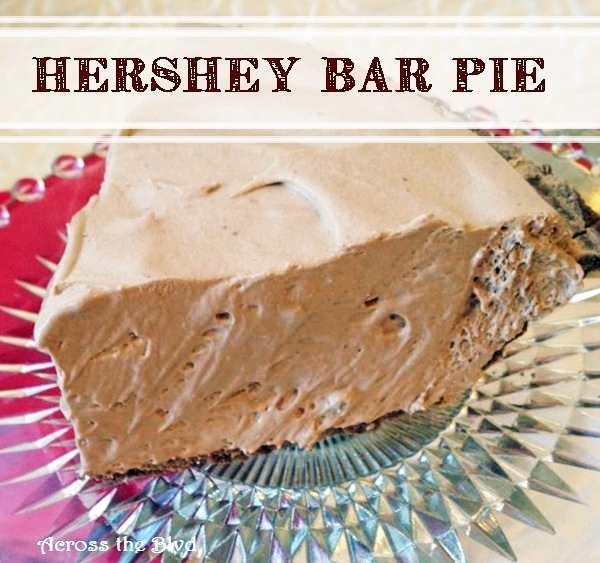 If you prefer chocolate, this Hershey Bar Pie recipe is for you! I have to admit that Pi Day is not a day that I would acknowledge if not for my husband who is an aerospace engineer. He’s one of those people who thinks math is fun! He thinks Pi Day is great. I think it’s just a good excuse for pie! 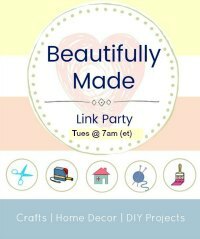 We’ll be sharing at lots of these great parties! It’s a quick and easy dessert. It was one of those recipes that came together based on what I had on hand. Hope you feel better soon, Katelynn. Beverly, Your pie looks delicious! I’m a coconut fan, but like you, not a favorite with the rest of my family. They are however, Pineapple lovers so I’m looking forward to sharing this recipe with them. We had pizza pie today . . . I think I would have much rather had a slice of this! Pinning and sharing! I’ve been eating it all week! I’m going to try it with coconut some time. Pizza pie works for Pi Day, too! Thanks for sharing. That looks and sounds amazing! HAD to pin it! Thanks for sharing at the What’s for Dinner party. Thank you, Helen! 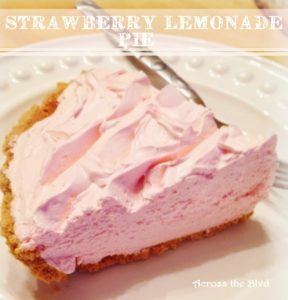 It’s a quick and easy dessert! Thanks so much for pinning and thanks for the party! Yum! I’m always up for a good pie! This will be a great one to make for Easter. This is a new favorite pie for me! Thank you, Rachel. I would love to have a bite please!!! 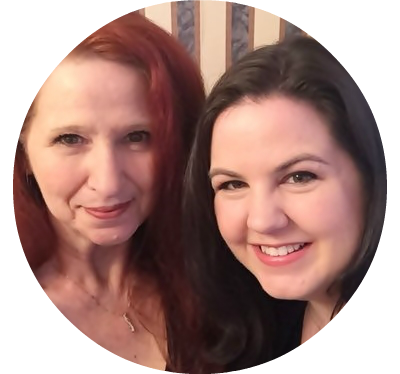 Thank you for sharing on Friday Features #omhgff on Oh My Heartsie Girl, your post being featured this week and will be shared on Instagram, watch for it. It will also be pinned on Pinterest and shared to Facebook. Now I hope you enjoy the little boost, and stop by again to share. It’s really tasty! 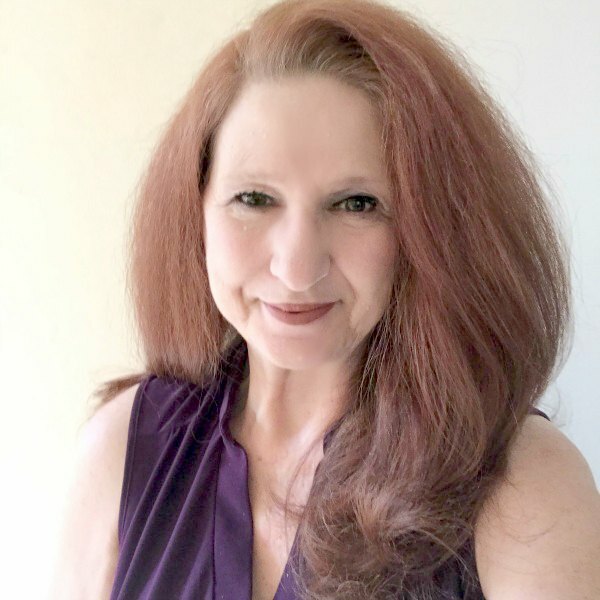 Thanks so much for including it in your features for Friday Features, Karren! I appreciate it! I’ll be sure to stop by for this week’s party.